WATERLOO – Can children judge the credibility of information? How do children integrate information from different sources? Can children edit out information from unreliable websites? Wilfrid Laurier University Psychology Professor Kim Roberts has received federal funding from the Canada Foundation for Innovation John R. Evans Leaders Fund to answer these questions and more, announced April 11 by the Honourable Kirsty Duncan, minister of science during an event at the University of Victoria. 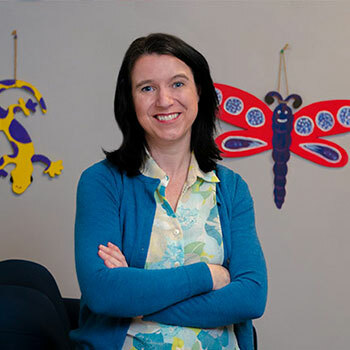 “This infrastructure will contribute immeasurably to Kim’s innovative research program, further enhancing her ability to produce meaningful insights into children’s memory development,” said Rob Gordon, Laurier’s vice-president research. Roberts, who runs the Child Memory Lab, examines how children remember and learn. Her research is critical to police, social workers, teachers and parents who rely on children to remember crucial information. The new funding will help Roberts investigate how to make children critical consumers of information. The funds will be used to build a digital recording suite that will allow researchers to measure, in real time, children's attention, eye movements and reaction time to websites and seamlessly integrate it with performance indicators such as accuracy and source confusion. The findings will answer several outstanding questions about children's memory that are pertinent to learning from different sources of information. Roberts’ innovative research program has already pioneered significant advancements in source monitoring, delivering important insights into the cognitive and developmental psychology of youth and memory. This digital recording infrastructure will enable Roberts to integrate state-of-the-art technology into her program to address factors in source monitoring that have emerged within the last five years. Roberts also founded the BrainWorx summer camp, a week-long day camp at Laurier where children participate in fun and informational themed activities each day to learn about the brain and body. The Ministry of Science announced more than $42 million for 37 universities across Canada to support 186 new research infrastructure projects. These investments, provided through the Canada Foundation for Innovation’s (CFI) John R. Evans Leaders Fund (JELF), will help universities attract and retain top talent from around the globe — particularly early-career researchers — with equipment that will give them a competitive advantage in their field. Find the full listing of funded projects.